Disclaimer: the following article explains an unauthorized modification of an electrical appliance which runs at high voltage and contains a lot of chemical stuff which doesn't play nicely at high temperatures. The manipulation explained in the article voids the warranty and modifies the product in a way which wasn't tested by the manufacturer. Unless you have enough experience, DO NOT ATTEMPT TO DO THE SAME MANIPULATION WITH A SAME OR SIMILAR DEVICE. 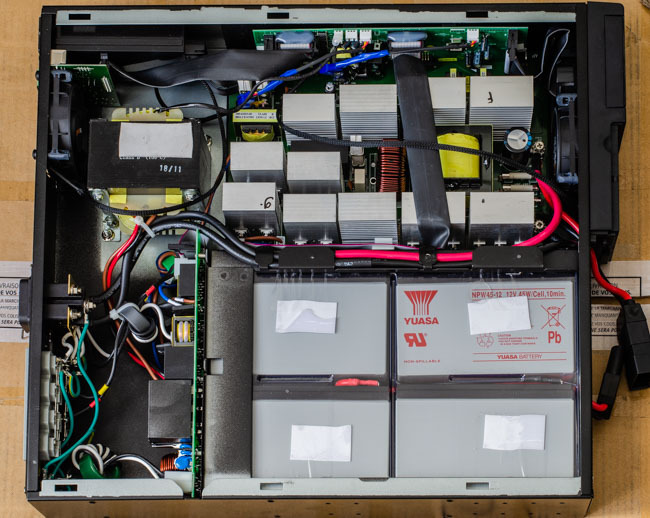 Not only you'll void the warranty, but you would be at risk of permanently damaging the product or compromising your own safety. I have a home office with a bunch of servers and network hardware. In order to protect myself against occasional problems with the power grid, I had two Eaton UPS units, but a firmware upgrade bricked both of them, so I had to buy another one. I ended up purchasing Eaton 5PX2200RT. This model appeared to have one problem: noise. It has two fans, Sunon ME80251VX-000U-A99, rated 37.0 dBA. This might not seem extreme—after all, most gamer's gigs have 40 dBA fans and higher, and servers usually run with 50 dBA or 60 dBA fans—but I made some effort to ensure all hardware is very quiet, and it appeared that the UPS was the one which was making most of the noise. So it was time to replace the fans. The first challenge was to find a quiet fan which is good enough for the job. Despite the device being 2U, there is no much place left inside, which means that the fans should have a high static pressure. 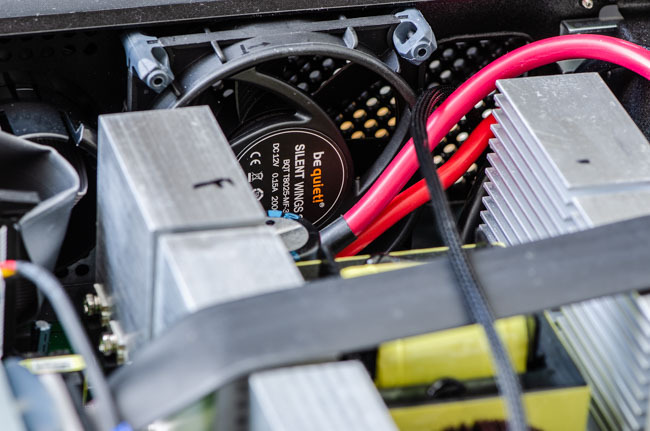 However, as I explained in my previous article, there are no much quiet fans with high static pressure out there, because ordinary users don't care about static pressure, and users who buy fans for servers don't care about noise. The 5PX models that are covered in this manual are intended for installation in an environment within 0 to 40 °C [...]. In summer, it is not unusual to have the temperature inside rising up to 35 °C around the rack cabinet. At the same time, the UPS is very underused for the moment, and will be for the next few years. Nevertheless, I'll monitor the temperature of the air flow exiting from the rear fan to ensure it remains within limits. When the new fans arrived, I had a bad surprise. The connectors used by the original fans are very different from the standard 3-pin connectors. Hopefully, the voltage was still the same, and in both cases, there is a black, red and yellow cable. 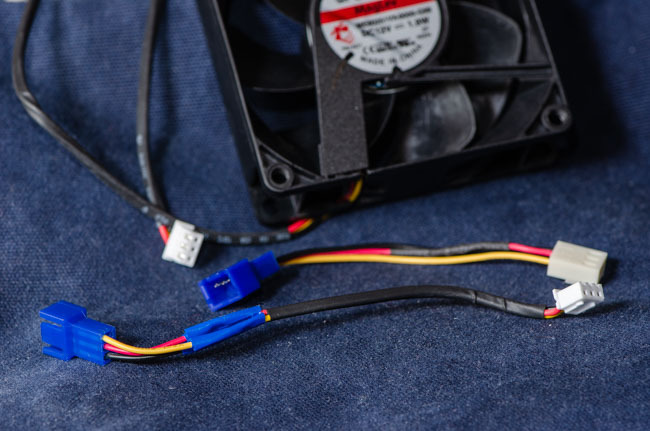 A rewiring can be made by cutting the cables of the fans and using the old connector with the new fan. 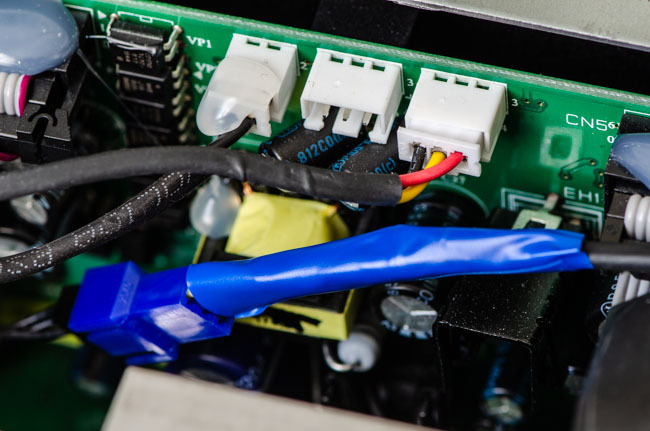 I was glad enough to have a bunch of short voltage reducing cables which I used instead of cutting the cable of the new fans; this way, I can still reuse the new fans with their original standard connectors the day the UPS will die. The original connectors are glued (the glue is still visible on a 2-pin connector on the left). I suppose that the manufacturer didn't expect the fans to be changed, and especially not by someone else than an authorized technician. Removing the glue is simple enough and doesn't leave any trace. There is an additional 3-pin connector on the board which wasn't originally used. I'm not sure what is its purpose, since it doesn't look like there is a place (or a need for) a third fan. Once the wiring is done, installing the fans is very easy and straightforward. Connecting them is easy as well, since the connectors are towards the middle of the UPS, so there is no need for extra long cables. 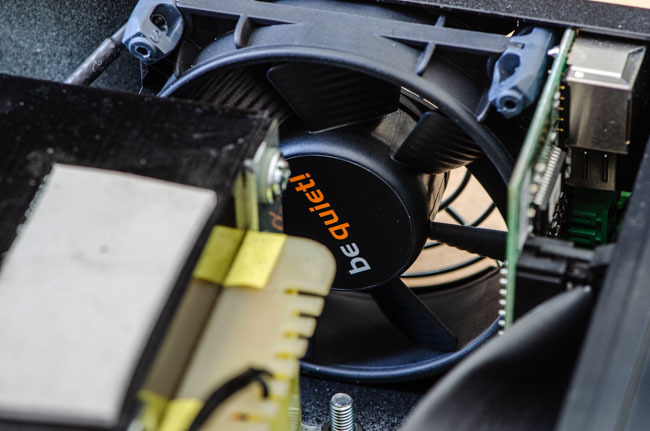 The fan on the back is close to a board, but it's still possible to insert the fan without damaging the board itself if you take enough caution. Here's the overall view. The fans are on the top left and top right.